Doing Nothing is an Environmental Policy in Itself. Policies and regulations intended to minimize the impact of development on natural areas are not being enforced. This is having an immediate and on-going impact on local wildlife, their habitat and safety as they are pushed closer toward human activity. The following tells the story of a current development where a supposedly protected natural area has been needlessly encroached upon. This could have been prevented with timely enforcement of the approved development standards. Ongoing construction of a monster home at 979 Governors Road, well outside the approved development zone, is needlessly displacing many neighbourhood deer. Former deer yard interior in fall 2014. The surveyor’s orange flag hung from the tree at left indicated the “limit of development” – no construction or fencing was to be permitted in the naturalized area to the east (right side) of that flag. This area has now all been bulldozed and the deer fenced out. The tree with the flag – a tall, mature white pine – is designated as protected, yet is marked with a pink X for removal. The tree on the right – a 30’ maple also designated “protected” – stands directly on the property line. It may also be at risk when a proposed permanent deer-proof fence is installed around the entire 7½ acre wooded property. Such fencing is not shown on any approved plan. The meadow was once a lush sanctuary for wildlife and provided a corridor between the Conservation Areas to the north and south. Here is a deer going up the hill to the deer yard, in better days. This approach, and the wooded pathways to the east that also led up to the deer yard, are now fenced off and completely inaccessible to wildlife. Despite the Niagara Escarpment Commission (NEC) policies that state wildlife habitats, corridors and natural areas must be protected, the property owners and their developer have been doing construction outside the permitted development zone. 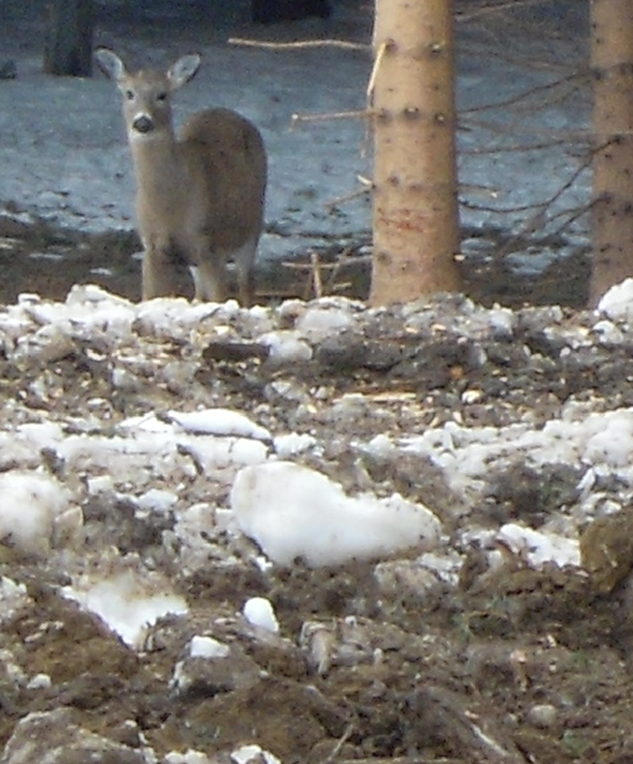 Deer at the entrance to the old deer yard – old blue barn (now long gone) visible at left rear. This is now entirely fenced off, and many of the protective trees are dead and gone. Timely enforcement by the NEC or City would have prevented this. Now all those agencies will do is provide feeble assurances that the natural area may be remediated at some unspecified time, after the damage, construction and fencing is done. This is how you kill a deer yard. The destruction went on for weeks. Officials from the agencies involved would not respond to our protests, then or now. The supposedly-protected deer yard habitat on the property has been completely destroyed, along with supposedly-protected trees. Entrance to the old deer yard now – completely inaccessible to wildlife. The remaining conifers are on our property. New wire fencing has recently been installed that hinders wildlife from using the treed corridors that have been in place for decades. These are the rows of trees planted in the 1970s to help establish wildlife corridors. The corridors are still very busy, as the tracks show -- but now they lead only to fencing. Restricting these wildlife corridors, and sheltered access to a pond to the north, means stressed-out deer now mill around beside the wire fence. Deer cannot cross these fences and piles of debris. The first fence erected in Fall 2014 – orange snow fencing – was knocked down by falling branches during winter storms. The deer then proceeded to step over it, to use their old paths up the hill to the woods and pond beyond. Now that stronger wire fencing has been erected, this decades-old approach is impossible. All we have ever asked was that that the conditions of development and policies regarding wildlife be respected and adhered to. NONE OF THE AGENCIES INVOLVED RESPONDED IN AN ADEQUATE OR TIMELY MANNER. Deer wallows and deer poop beside the fenced-off former deer yard. Unable to proceed up the hill, the deer now return south onto busy Governors Road. Developers have been allowed to break the rules and approved conditions, upsetting the balance of deer and humans that formerly worked very well here. Why would the authorities not stop them? Heavy-duty fencing now criss-crosses the area that was outside the development zone, intended to continue as a naturalized area. Restricting the connections across countless wildlife corridors and cutting off two vitally-important wooded ponds will displace many more deer and other wildlife. Everyone living on the perimeter of the fenced-off forest will be affected. Efforts to have her address this issue with the various agencies have gotten nowhere, but perhaps hearing from more constituents would help. Please help us in our efforts to have the naturalized and protected deer yard restored NOW, before any further construction activity occurs. Thanks for caring about our local wildlife. Very sad. Can you date these posts? What is the situation at present? Who Can We Contact About This Situation? What Can or Should be Done with the Deer Yard? What is a Deer Yard? Where Have the Displaced Deer Gone? What Do the NEC Policies and Conditions Say? Help Save Dundas is working to preserve the natural heritage and wildlife in the Dundas Valley. Active and timely enforcement of environmental regulations by all agencies is necessary if we ever wish to maintain a balance between nature and human activity. Doing nothing is an environmental policy in itself.